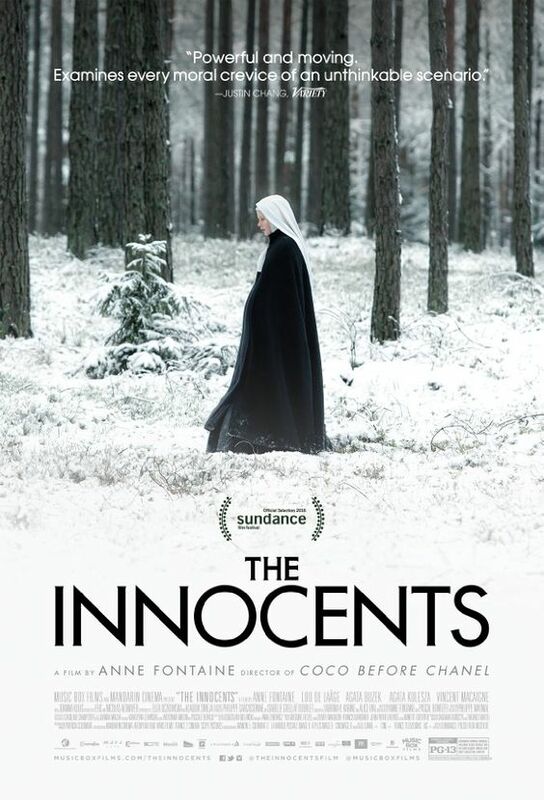 French film-maker Anne Fontaine’s The Innocents (aka ‘Agnus Dei’, 2016) shines light on one of the agonizing chapters of World War II. After the winter offensive of 1945, during the so-called liberation of Poland, waves of women and girls were raped in Polish cities, which fell under the control of Red Army marauders. Soviet soldiers were also engaged in widespread theft of personal property. Until the disintegration of Soviet Union, the subject of sexual violence against Polish women was blacked out from Poland’s historiography. Fontaine’s movie opens on the winter of 1945, at a Polish convent. At the crack of down, a group of Benedictine nuns sing a serene hymn to the lord. The camera gradually zooms out before resting on the face of a young nun. The sense of anticipation exhibited by the nun seems to suggest an affliction, lying beneath this tranquility. The young nun walks out of the convent in the snow-drenched landscape in search of a doctor. An orphan boy leads her to the campus of French Red Cross workers, who are reluctant to breach the code and make a trip to the nunnery. Mathilde (Lou de Laage), a doctor’s assistant for the Red Cross, gazes outside her window and looks at the anxious nun, kneeling down in the white snow and praying. The frame lingers closely on Mathilde’s beautiful face, wisps of cigarette smoke flowing around her. The muted emotions give us the feeling the she is going to transgress the rules to go with the nun, which will change her life forever. Film Theoretician Bela Belazs often talks about the power of expression through the well-crafted close-up shots of human face. He says that human face marks the ‘very instant in which the general is transformed into particular’. Similarly, in The Innocents, Fontaine tries to evoke the character’s inner torment by observing the fleeting emotions in their faces. When Mathilde first enters into convent she perceives it as a peaceful refuge in the times of war. She is taken to a pregnant woman whom the authoritative abbess (Agata Kulesza) says is thrown out by her parents. Asking a young sister Maria (Agata Buzek) to hold the single glowing lamp, Mathilde performs a caesarean on the woman. It is only on her second visit, Mathilde learns about the painful cross the sisters carry within them. The sisters were raped by Soviet ‘liberators’ during a three-day raid. Seven of the nuns are in the late stages of their pregnancies. Various conflicts seem to confound the nuns: some fear eternal damnation; some are ashamed to let the doctor to do physical examination; some feel that their faith is also violated alongside their flesh. Lou De Laage plays the central character Mathilde. She gives a more composed performance, which is the exact opposite of the role she played in Melanie Laurent's "Breathe"
Mathilde is an atheist, raised by communist parents. She is a sexually liberated woman who struggles for respect in a profession dominated by scoffing males. This may be the initial reason to breach the code and help the Polish nuns. She wears khaki shirt & pant and a blue scarf, which seem to reflect the sadness pervading the war-torn land. During one of her trip from the convent, Mathilde is stopped by Russian soldiers. She is assaulted and nearly raped (a Russian commander stops the soldiers). This traumatic experience brings her closer to the nuns’ inner torment. When she wakes up next day to the soothing prayer chant, Mathilde finds the quietude that’s missing in her life. Mathilde later earns the sisters’ respect and love when she blockades a big disaster. Anne Fontaine and DoP Caroline Champetier somber, painterly images brilliantly express the truth and beauty amidst the bleakness. The muted palette of blue, black and grey subtly captures the featureless frozen landscape and the frigid faces. The collective depression inside the convent is efficiently suggested without any psychological explanations. Director Fontaine focuses on emotionally resonant smaller details. For most part of the narrative, she shows amazing restraint. In one scene, Mathilde touches the pregnant belly of a young nun. The nun immediately explodes in laughter, for it may be the first time as a adult she is touched by another adult in a non-violent manner. But, as sister Maria looks at the young nun, the sudden laughter is replaced back with muteness. It’s a very small moment in the narrative which conveys the nuns’ repressed lives. The initial C-section scene is filmed in a disquieting manner, which seem to suggest the brutal violations faced by women of the land. Even in the dialogue-heavy scenes, Fontaine lingers on the pauses and silences to create a haunting effect. Sister Maria’s calm explanation of faith (“Faith is 24 hours of doubt and one minute of hope”) stays long after the end-credits. Nevertheless something seems to be missing in the film which stops it from being a masterpiece or a must-see work. The flaw I felt was in the script written by Alice Vial, Pascal Bonitzer, Sabrina B. Karine, and Fontaine. The narrative tries to be about a French woman caught in extraordinary circumstances; about nuns and the possible annihilation of their bodies & faith; and an allegory of a nation looking at aftermath of a brutal invasion. The narrative moves in between the themes, sometimes robbing us of the space to care for individual characters. The scattered examination of spiritual crisis, horrors of war stops it from being a sharply focused character study on three women – Abbess, Sister Maria, and Mathilde. The terrific actress Kulesza is burdened with a very two-dimensional character. Apart from the confrontation with Russian soldiers, Mathilde has little to offer to the central crisis or drama. The character of Samuel – Mathilde’s superior and love interest – was under-developed as he is only meant to tell Mathilde that not all Poles in WWII were good ones. Even his contradictory action of helping the nuns isn’t connected well with the main themes. “The Innocents”, thanks to impeccable cast (Lou De Laage was charismatic) and visuals, is still a poignant and painful portrait of womanhood, in times of war. But with robust script, it could have been a wonderful allegory on women condition (the women in The Innocents don’t feel safe, whatever their ideology and costume choices are). The screenwriters also haven’t compellingly put forth the question of an individual restoring the belief in God after being tormented (physically & mentally) in such a vile manner. The ending definitely feels good, although we feel that the initially promised profound exploration of afflicted human souls is only tentatively realized. The Innocents (116 minutes) breathes in a glimmer of hope into a period of bleakness. It is consistently absorbing and maintains the artistic integrity in telling a little known wartime atrocity. With a shrewd focus and profundity, it could have been a masterful film about female persecution and spiritual crisis.